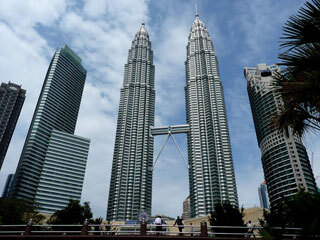 The Petronas Towers, also known as the Petronas Twin Towers, are twin skyscrapers in Kuala Lumpur, Malaysia. According to the Council on Tall Buildings and Urban Habitat (CTBUH)'s official definition and ranking, they were the tallest buildings in the world from 1998 to 2004 and remain the tallest twin towers in the world. This article uses material from the Wikipedia article "Petronas Towers", which is released under the Creative Commons Attribution-Share-Alike 3.0 License.